Josh Hawkes scored the winner from the spot (Shutterpress). 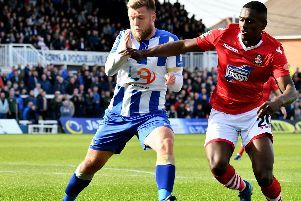 A fortuitous Josh Hawkes penalty was enough to see Hartlepool claim all three points at the Super 6 Stadium, denting Wrexham's National League title push. The Dragons were just one point off the top of the fifth tier heading into this one and remain so after Hawkes' ninth goal of a real breakthrough year at Pools. But Bryan Hughes' men have played a two games more than current leaders Leyton Orient and look destined for the lottery of the play offs. 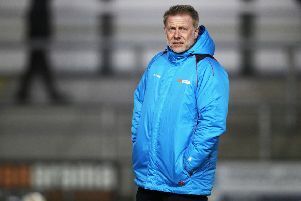 This result was another feather in the cap of manager Craig Hignett, who has transformed Pools since his arrival in the dugout. After his England C exploits in the week - where he played more than an hour in a 2-2 draw with Wales C - Luke James was rested with Nicky Featherstone recalled and Ryan Donaldson pushed into a more advanced role. Youngster Adam Bale, signed last week on a free from Sunderland, joined James on the bench. Aaron Cunningham returned to the XI after a calf problem, covering for David Edgar, who is away on international duty with Canada. Both had sides produced little in the way of action in either third in what was a dull opening 20 minutes, which had the feel of an end of the season game - a surprise, really, as Wrexham have promotion back to the Football League on the agenda. In the 24th minute the game sparked into life, briefly, as Hawkes' jinking run into the area was halted by the challenge of Jake Lawlor and Marc Edwards had no hesitations in rightly pointing to the spot. Hawkes dusted himself down and confidently struck straight down the middle, but straight at Rob Lainton, although the ball, somehow, spun away to creep over the line. That was about it for goalmouth action in the opening 45, although there was some bad news on the injury front for Pools. Just before the half hour Cunningham, back after a fortnight out of action, crumpled in a heap holding his knee in quite some distress. It was the end of the road for the youngster, in what could prove another slice of bad luck on the injury front for a player who has impressed when called upon this season. Into the second half and Pools' slender advantage was close to crumbling when a mistake by Scott Loach was pounced on by Akil Wright - his header was nodded off the line by Nicky Featherstone. Loach then pulled off a cracking save from Chris Holroyd as the ball was recycled from the initial chance to keep it at 1-0. Pools pushed for another late on. A Hawkes corner whipped through a crowded area at pace and skipped past the head of a diving Nicke Kabamba at the back post. Roles were then reversed as Kabamba turned provider - his break down the left created space, the striker then squaring to Hawkes, who cut back on his left, but fired over. And that was the way it stayed at the Vic as Pools saw off one of the National League's big hitters with relative ease. The result sees Pools finish the day in the top half of the division in 12th place.